Nancy Lee Vogelsang Onion of Austin passed away peacefully at 89 years of age on December 26, 2018 surrounded by family. She is preceded in death by her husband of 60 years, Judge John F. "Jack" Onion, Jr. and her parents, Emmie and Helmuth Vogelsang of San Antonio. She is survived by her brother, Curry H. Vogelsang of Sherman Texas and his wife, Barbara Buchanan Vogelsang. She is also survived by her three children, John Frank Onion, III of San Antonio and his wife, Christi, David Onion of Austin and his wife Susan, and Carol Onion Tinney of Austin and her husband, Jay Tinney, as well as, her six grandchildren: Kate Onion, Frances Onion, John Onion, Scott Onion, Paige Tinney and Case Tinney. Nancy is a descendent of the Vogelsang family, a pioneering German family who settled in Milam County after first arriving in Galveston, Texas in 1848. Nancy was born in San Antonio, Texas in 1929 and attended school in Alamo Heights. Graduating early from Alamo Heights High School, she enrolled at Trinity University where she met her future husband in a tennis class. Later Nancy graduated from The University of Texas at Austin where she was an active member of the Alpha Delta Pi Sorority. Upon graduation, Nancy returned to Alamo Heights and commenced teaching home economics in the very schools she attended. In 1958, Nancy married Jack Onion and became a devoted partner in both family life and Jack's political career, serving as his state-wide election campaign manager. Nancy was a selfless servant to her family and to her community. She clearly demonstrated the Christian value of putting the needs of others before herself. Nancy was involved in her children's daily lives making sure that they were not only cared for but were truly happy. She was a lifelong Episcopalian and a member of The Church of The Good Shepard for over forty-five years. 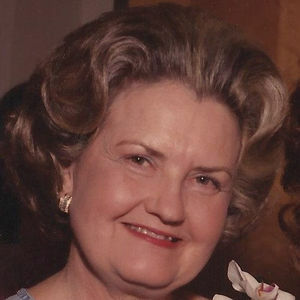 She also invested countless hours into many community organizations serving as president for the State Officials Ladies Club, founding member of the Sierra Verde Garden Club, the Home Economics Advisory Council at The University of Texas, the Docents of the Governor Mansion and the Settlement Home for Children. Her passions included cooking, sewing, photography and travel. Nancy and Jack traveled to Europe more than thirty times. They loved planning extensively for the perfect trip each summer, but sometimes would take off on short notice if they found a trip that struck their fancy. Traveling to Europe was their special time, and it reinvigorated them. The family would like to thank Dr. H. Kent Beasley and Dr. Kenneth Kroll for their decades of exceptional medical care, as well as, the loving and caring staff of Querencia at Barton Creek. A celebration of life will be held on January 8, 2019 at 2:00 p.m. at the Episcopal Church of the Good Shepherd in Austin, Texas. A private burial will take place in the Texas State Cemetery. In lieu of flowers, memorial contributions can made to the Settlement Home for Children, 1600 Payton Gin Road, Austin, Texas 78758.